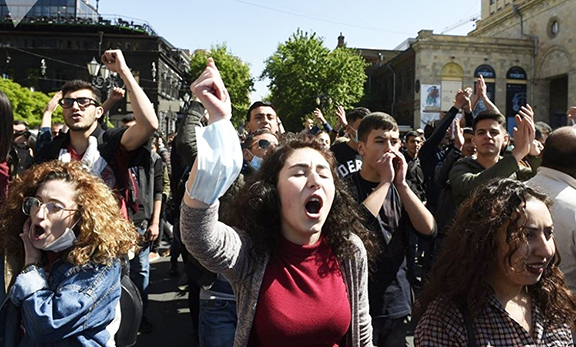 YEREVAN—Efforts and hopes to bring together opposition forces under one banner to contest in the upcoming May 5 Yerevan Municipal Elections—Council of Elders—dwindled this week, with seven parties registering with the Central Electoral Commission Thursday to take party in the polls. One of the parties, which submitted its list of 65 candidates for the City Council race was the Armenian Revolutionary Federation, whose leader Armen Rustamian last week had pinned hopes on the May 5 votes as a means for the popular movement to gain momentum and, and if successful, become a significant player in Armenia’s political arena by governing one-third of the country’s population. Rustamian leads the ARF’s list, with the party’s parliamentary bloc secretary Aghvan Vartanian in second place and Supreme Council of Armenia co-chairman Arsen Hambartsoumian in third place. The first person on the list of a party that wins the majority in the Council of Elders elections is selected the mayor of Yerevan. The number two party in parliament, the Prosperous Armenia Party, also registered to participate in the elections. Leading its list is parliament member and former foreign minister Vartan Oskanian. The current mayor, Taron Markarian tops the list of the ruling Republican Party of Armenia’s list, which includes 195 candidates. The presidential election’s main opposition candidate Raffi Hovannisian’s Heritage Party announced Thursday that it was forming an alliance with five smaller opposition groups to take part in the municipal elections. The new alliance, called “Barev Yerevan,” which derives its name from Hovannisian-led popular movement known as Barevolution, will see deputy chairman of Heritage Armen Martirosian lead its roster of candidates. “Participation in the mayoral elections will not replace our national rebirth. It will be merely one of the fronts for continuing that struggle. We are going to fight on all fronts,” Hovannisian told a press conference at Liberty Square while continuing a hunger strike he started on March 10. Former president Levon Ter-Petrossian’s Armenian National Congress has also registered to take part in the elections. Prosperous Armenia Party spokesman Tigran Urikhanian told RFE/RL’s Armenian service (Azatutyun.am) that his party is ready to cooperate with the opposition in trying to prevent possible vote rigging. Urikhanian said his party is ready to form a multi-party campaign headquarters for that purpose. On Wednesday, Oskanian expressed support for the popular movement led by Hovannisian. “Six hundred thousand people expressed their protest against the current authorities and demanded changes of persons, approaches and policy, and right now the carrier of those changes is Raffi Hovannisian,” he said. “He has the moral right to that and it is up to him to decide what to do with those votes. Very disappointing. Diluted opposition. Same story. Same result.